Moves, bugs, and the undead. It's that time of the week again. Time to shake off the weekend vibe and get back to work. But you can probably spare a few minutes to check out some new apps. 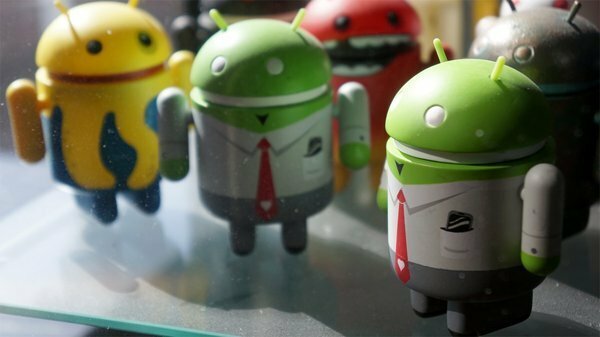 This is the Tested Google Play App Roundup, which is where we tell you about the best new and newly updated apps on Android. Just follow the links to Google Play. This week we have an app that really moves you, a game about mutating insectoids, and the ultimate zombie shooting sim. Your phone has a highly sensitive accelerometer in it, so why not use it to count steps while you're going about your day? Battery life, that's why. Most apps that count steps have to keep the device partially awake to track your movements, but Moves does things a little differently. This is an app that is smart enough to figure out what you're doing and where you're going so it can generate a simple daily report of how active you are, but it doesn't kill your battery. All you have to do to get Moves set up is open it, then go about your day with the phone in your pocket. Remarkably, this app doesn't have to keep the phone in wakelock mode all the time to gather its data. That means the device can still be in deep sleep most of the time. It does appear to use a partial wakelock, but the time is fairly low. When you open the app, it will refresh the tracker with the updated data. Additionally, Moves will go into hibernation if it detects that you haven't moved in a while to save even more power. A series of dots at the top of the screen will show how many steps you've taken, as well as distance ran and cycled (but only if you've done those things). You can scroll downward to see your activity throughout the day. Moves tracks your locations and the routes you took to get there. It's smart enough to figure out if you are in a car and marks those stretches as transit. There is also a map view where you can see a color coded depiction of your path throughout the day. I've been keeping an eye on the way Moves uses battery, and it seems to pull about 5% of the total usage over the course of an average day for me -- that's less than Cell Standby. BetterBatteryStats reports a little over one hour of partial wakelocks from Moves per day. That's pretty low for an app that's tracking things in real time. 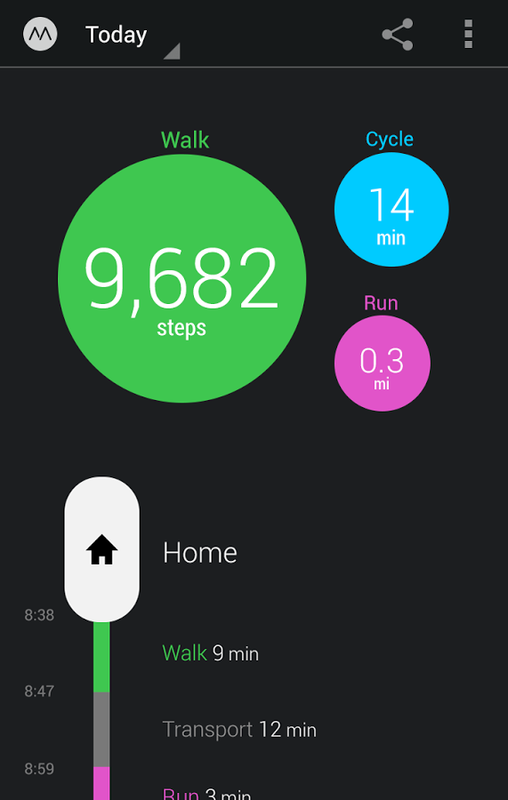 Moves isn't quite as convenient as a Fitbit, but it's a very impressive free solution for your Android phone. Give it a try! Physics puzzlers have expanded to become a huge genre on mobile devices, with Angry Birds being only the most prominent example. Just because there are multitudes of games in a space, that doesn't mean there is no room for innovation. Incredipede proves that. This title gives you control of an insect that can mutate on the spot to cope with new challenges and obstacles. It's incredibly bizarre, but also very cool. There are over 120 levels in Incredipede, each with a different challenge to figure out. You can play the game in normal mode or hard mode. The hard mode contains some more challenging versions of the levels, but you're also required to build part or all of the creature which will carry you onward in each level. In normal mode, you are given the necessary design and simply have to control it. The controls are incredibly straightforward -- just press one button to contract the pink muscles and the other one to contract the purple. 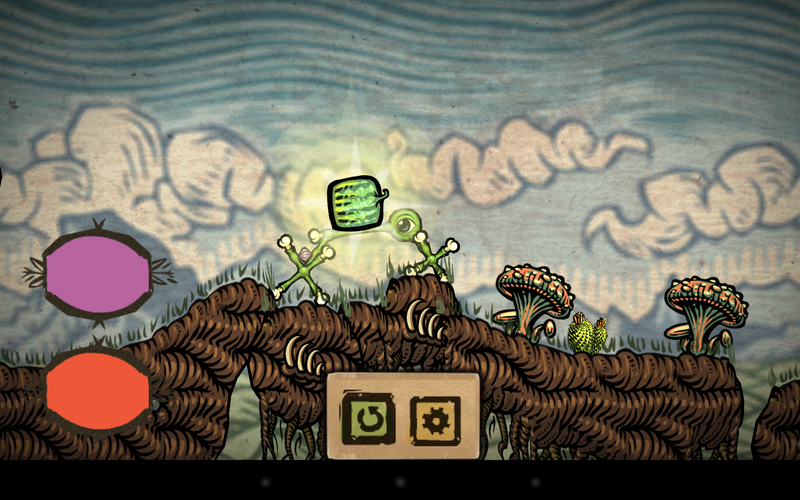 The first few levels seem overly simplistic, but the game slowly ramps up the difficulty. Your goal is to find some way to collect the fruit in each level, and get to the exit. Sometimes you'll be a sprawling, multi-legged creature that has to climb over rough terrain to grab the fruit. Other times, you're just a worm that has to inch through a tiny opening and roll down a hill. You never know what the next level will bring. 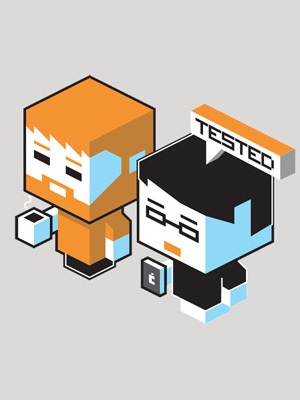 The game has a solid physics engine, and you'll get the hang of how it behaves quickly. You have to finesse the limbs/graspers/whatever to get you where you want to go. 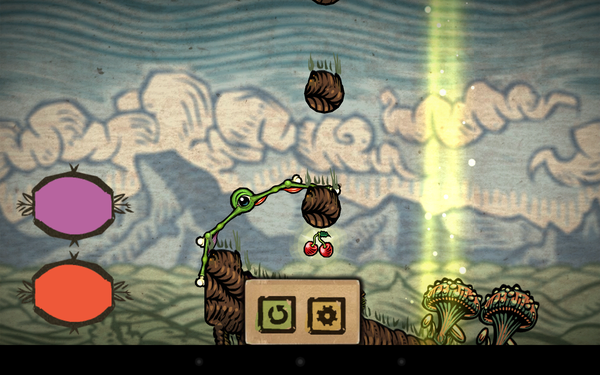 The physics in Incredipede don't "cheat" you by being too unforgiving. The level of difficulty seems just right. It's rare that I come across a game that has a distinctive look anymore. There are a ton of titles that look animated or cel shaded. Incredipede, however, looks like a living oil painting on your screen. It has very interesting thick lines and colors that blend into each other. It's visually fascinating. Incredipede is wonderful to experience. The gameplay mechanic of the mutating creature makes every stage a little different, and the simple controls mean that you can realistically move a complicated beast around the level. At $2.99, this game is worth it. It's on sale for $1.93 as of this posting, though. Shooting zombies is a good time, but shooting zombies from a heavily armed AC-130 ground attack aircraft is a great time. 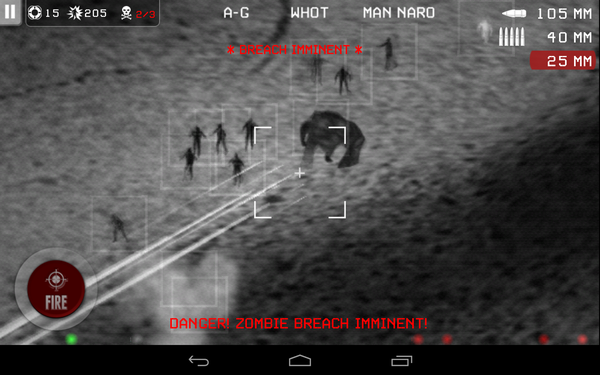 There's not really a plot in Zombie Gunship, and it doesn't need one. It's just non-stop zombie slaughtering action, but watch out for the humans. 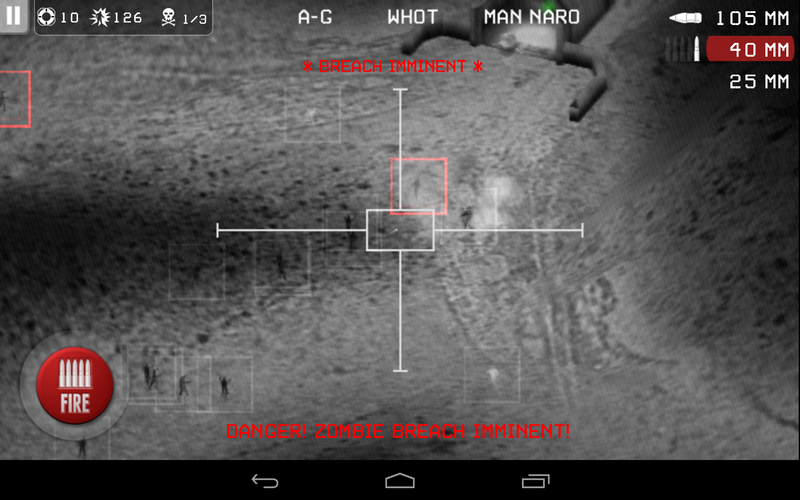 You've probably seen infrared/thermal imaging videos (like FLIR) taken from police and military vehicles, right? It's a sort of glowing black and white image where living things are hot white and the background is gray-black. 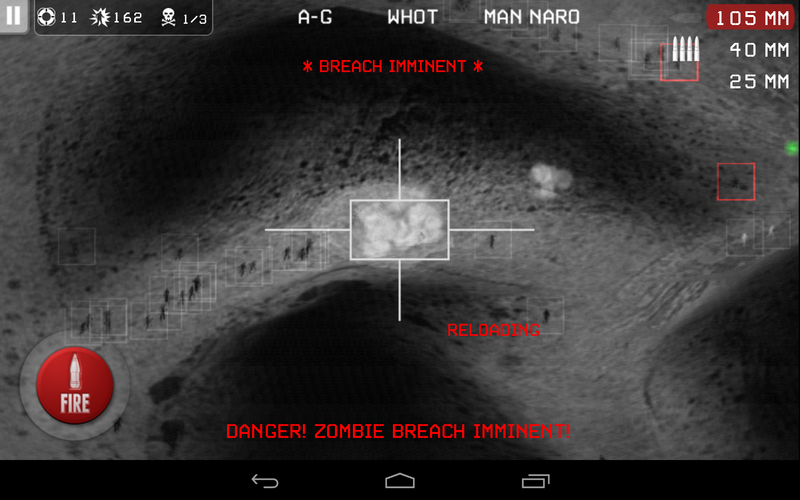 That's what you get in Zombie Gunship -- a top-down isomorphic view of the battlefield as your aircraft slowly circles. Zombies will begin pouring in from all sides, and you have to stop them from making it to the bunker as long as possible, while also clearing the way for human survivors to reach safety. The zombies are the shambling cool black forms and the humans are white-hot in your camera feed. Taking out too many humans ends the round, but so does allowing a single zombie to reach the bunker. You have three weapons at your disposal to do this -- a 25mm gatling gun, a 40mm Bofors autocannon, and a 105mm Howitzer cannon. You cycle through the weapons by tapping in the upper right corner. then simply pan around, and press the fire button. The waves of zombies will become more intense as time goes on, and will even include larger mutant undead that take more hits to dispatch. All the time you have to watch out for humans so as to avoid collateral damage. You earn coins from taking out zombies and saving humans, which you then use to buy weapon upgrades and access to new missions. There are in-app purchases, but you earn plenty from playing the game, so I'd consider that a non-issue. The heat-mapped look of this game is not incredibly detailed, but it looks very real. You could be looking at actual infrared video, if it wasn't for all the zombies. This title doesn't need to render high-resolution textures or smooth vector lines. 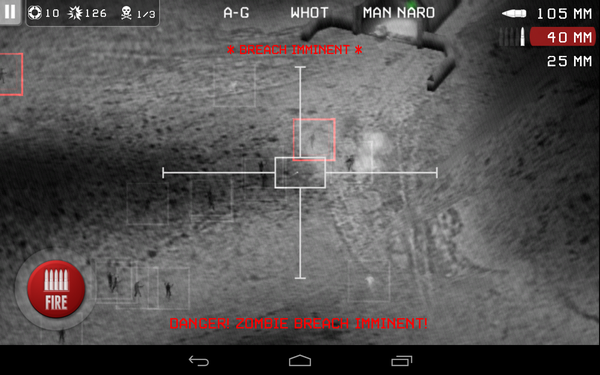 Zombie Gunship takes a different route to realism, and it works well. This game is $0.99 in Google Play and I can hardly put it down. You should buy it.